Since my son was a baby we have always read to him as apart of our bedtime routine. He enjoys his books and as he entered Kindergarten this year he has become even more eager to start reading on his own. He loves sounding out words but does get frustrated when he can’t figure out a word on his own. 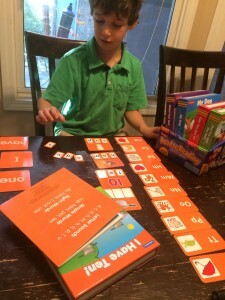 As a reading specialist for many years I have learned that reading is best taught using a combination of three methodologies: Auditory training – training for the ears to prepare the child’s brain for phonics, Phonics – knowledge of letter(s) sounds and Whole Language – immediate application of phonics into connected stories. I went to Lakeshore to look for a learning activity so that I can work with him on his reading. I also wanted to get something fun and engaging so that he wouldvcontinue his love for learning. Since my son goes to a Montessori school, he is use to a very hands on/kinestetic approach to learning so I wanted something that followed in line with that theory as well. I found the Road to Reading Activity Center and couldn’t wait to bring it home and show my son. The set has 5 mini book cases, each book case includes three reading activities and a book. The 1st activity in the case helps you to learn the letter sounds by matching pictures with the first initial sound (phonemic awareness). The 2nd activity has you look at a picture and with letter tiles, phonetically spell out a three letter word. The 3rd activity has you trace with your finger a raised sandpapery feeling word, many of those were words are “sight words” (words that you just need to know because they don’t follow the sound-out rule, like “the”). Once all three of these activities have been accomplished successfully you are now ready to read the book. The great thing is that all the words in the book were learned during the three activity exercises. My son felt so accomplished to read the book independently. When he came to a word he didn’t know or couldn’t sound out he would look back at his activities to try recall what the word was. I am so excited to see his enthusiasm every night as he works on his selected Road to Reading book case. When he reads the book perfectly he knows he can move on to the next case. The books build on the words that were learned in the previous book cases. He even asked if he can bring his books to school to show his teacher how well he can read now. I appreciate the fun stories that are filled with colorful illustrations. The greatest thing is he is just as excited now as he was when we first got it. As an educator I am so impressed with the understanding of reading readiness that went into developing this activity. 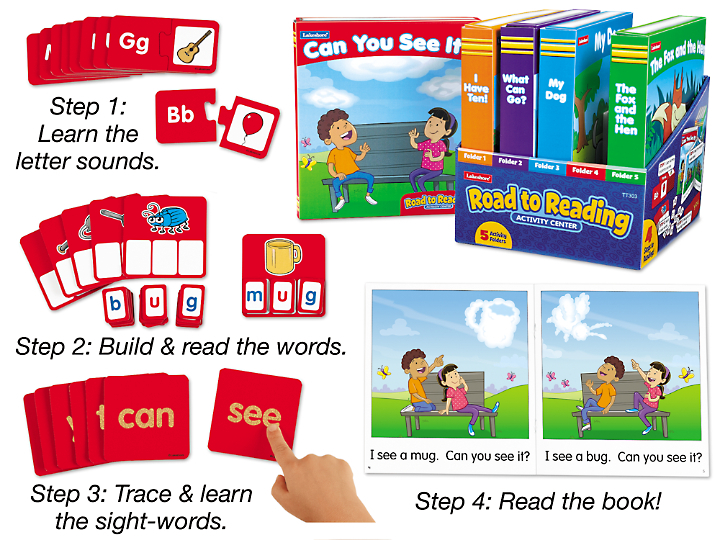 It helps develop skills in reading CVC words (consonant, vowel, consonant), sight-words (high-frequency words), letter-sound correspondence, beginning sounds, middle sounds and ending sounds. It warms my heart to see how much my son likes to read the stories to his little sisters now and he is so proud of himself as he reminds them, “When you get to Kindegarten and are big like me you will also know how to read!”. I recommend the Road to Reading Activity Center to anyone who is looking for an engaging and systematic approach to reading for their little ones! Click here to download a 20% off coupon for Lakeshore!